Apart from our guide about crypto trading instruments, we also present you this crypto trading apps review. We go over best apps for trading cryptocurrency that are available on both iOS and Android platforms. Some need payment while others are free to use. Thus, we provide a detailed description, pros, and cons of each crypto trading app that is available for traders to use. Related articles are crypto trading tools and crypto trading platforms. Apps offer a channel of trading that is always next to you. Trader carries his/her phone with them all the time. Thus, platforms would work no matter where you are located as long as there is an internet connection. Another advantage is that apps usually include several exchanges in its services and provide other services regarding analysis. Instead of using complicated APIs and bots to reign in data, apps do it for you with a couple of taps. 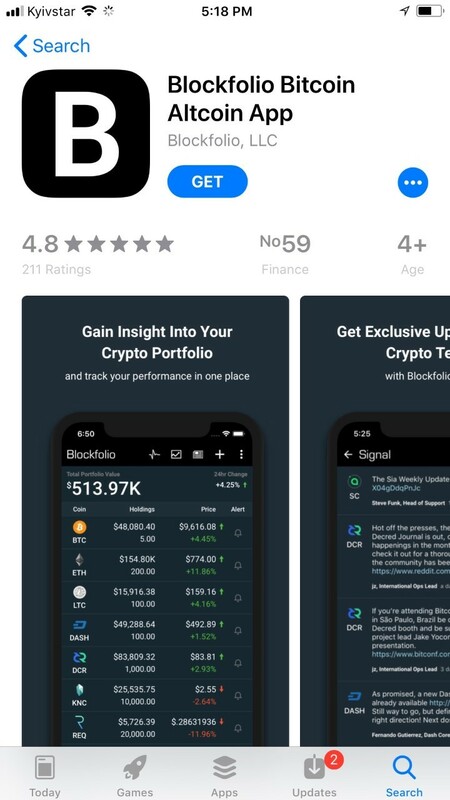 The Blockfolio app has several features to offer you should you choose it. The platform operates as an analysis web space, where a large amount of data can be compressed and analyzed. It supports over 3.000 cryptocurrencies through live trade data analysis. The app functions as an API, offering charts, signals, and alerts even. The app also connects with your accounts in trading platforms, tracking your investments, profit margins, and balances. Thus, it can serve as security tool if you wish to check your balances regularly. The best part is the fact that the app is free to download for traders around the globe. Traders also have an option to receive the latest news from the market by including “News Selection”. You do not need to provide scanned ID nor any personal details apart from your mail and name/last name. You can check out its interface on Apple Store in the snapshot below. If you wish for more of a simpler trading app, bitcoin Ticker might be the right app for you. The phone software is the property of XBT Apps Ltd, which made their product very easy to use. It is suitable for starters since it does one and one thing only – track bitcoin’s price. The value fo the program lies in the fact that it tracks down data from all major exchanges and trading platforms. It actually provides charts that are easy to understand, with indicators necessary for in-depth analysis. Unfortunately, that is about it when it comes to its services. Unlike other apps, it does not offer other cryptos apart from bitcoin. Furthermore, it does not include balances form your accounts in platforms, as some apps like Blockfolio do. Nevertheless, it is free to download and you keep your privacy. You do not provide any personal information since you only download and use the app. It is available for iPhone and Android users. Interestingly enough, it also has a platform on a web browser, as seen in the picture below. Crypto Pro is similar to Blockfolio app in several aspects, as far as these crypto phone apps go. Developed by Samuel Laska, it offers services regarding 1.00 and more cryptocurrencies. Also, you have several features at your disposal, them being alerts, signals, and news. All you have to do is to go to your “Settings” and check the boxes regarding each of these features. As for the interface, it offers a simple chart forms. It also offers most crucial buttons on your platform page, making this app quite easy to use. You also have indicators and liberty to change charts according to your needs. What limits the app is the number of currencies that you can watch simultaneously. Only 10 to 12 can be visible, though we do need to mention that phones do not come with large screens and desktop does. Hence, the small number of display possibilities. It is free to download an use and is available in Apple Store and Google Play. The creator of the CryptoTrader, Zerion LLC, aimed to provide an app that would help traders locate cryptocurrencies that are trending. It does so by analyzing volumes and prices within several platforms. It also provides chart and table presentations, imbued with indicators necessary for in-depth analysis. Its interface, much like other bitcoin trading apps, is built to serve starters and experts alike. Most of the charts are somewhat customizable, as you can change types and colors of the charts. As for the cryptos, trading with over 100 cryptocurrencies are supported, including Bitcoin trading, Ethereum trading, Litecoin trading, and Ripple trading. The app supports a smaller number of platforms that its counterparts, them being Poloniex, Bitfinex, GDAX, and OKCoin. You also have news, signals, alerts and EMA and MACD indicators, serving you to make most of the market information. The app is free for download, available in both platforms, iOS, and Android. BitTrader is a crypto trading app that allows users to track and follow up on cryptos’ prices. The software is the sole property of Catalyst Communications Limited, which developed the app for both iPhone and Android users. More importantly, its services are globally available, though it is worthy to note most other apps are as well. Supported coins in this app are bitcoin, Ethereum, Ripple, Litecoin, and Bitcoin Cash, all of which have same features. Apart from price charts, you have at your disposal live trade ticker, signals, alerts, and news feed. What really sets this app from other is the opportunity to connect it with Bitstamp exchange. In that way, you can purchase and sell coins using the phone device. Like most trading applications, BitTrader offers its services for free and can be downloaded by anyone around the globe. Both iOS and Android devices are supported, meaning anyone with a Smartphone can access and use the data analysis. In this crypto trading app review, we went over the available phone apps that can serve as a trading analysis tool. Our investigation indicates that the industry now has many of these applications readily available for traders to use. Moreover, most of them offer similar services and are easy to use. News feeds, indicators, charts, signals, and alerts are all part of platforms.